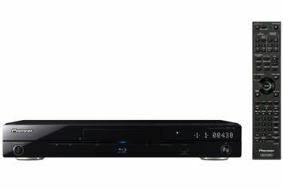 HOT DEALS: Pioneer offers free 3D Blu-ray player with Award-winning AV receivers | What Hi-Fi? Buy a Pioneer VSX-2020 and you'll get a free BDP-430 3D Blu-ray player; go for the Pioneer VSX-LX53 (Best receiver £1000-£1500), SC-LX73 or Award-winning SC-LX83 (Best receiver £1500+) and you'll qualify for a free BDP-LX54 3D Blu-ray player. Both the receivers and Blu-ray players can be operated using Pioneer's iControlAV app for the iPhone/iPod Touch, while the players themselves combine 3D playback with advanced networking features. The offer runs until February 28th. To take part, simply download the voucher at pioneer.co.uk/free3D ands take it to your local Pioneer dealer.